There is no better way of stopping tradeshow or expo traffic at your stand than a brochure stand that has literature on both sides. Brochure holders are ideal for tradeshow visitors that don't wish to talk face to face or for when you are busy and can't communicate with everyone who stops. The premium Z fold brochure stand is stylish and professional. It offers A4 brochure display x 3 on two sides. 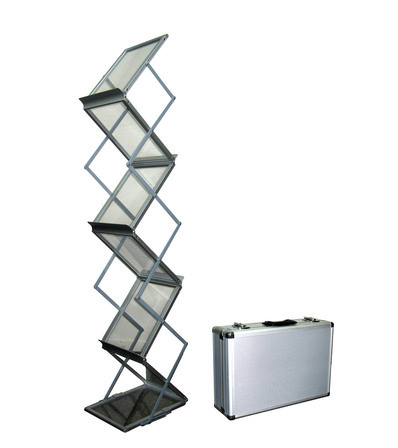 The stand is aluminium and has clear panels which give it a more professional finish. The premium Z fold brochure stand comes with a hard carry case.